Wow - this week is already challenge #45 - how time files! This weeks challenge theme is Graduation - I'll be needing plenty of ideas - as my oldest will be graduating in a few weeks. I decided to use the Double Pocket Fold from a past TJNL - altering mine a bit. When this technique was first posted back in 10/07 - I had used a piece of 6" x 6" paper, and made my flap fold to the front so it opened like a card. That size was too small to hold a gift card - so for my challenge card, I used a piece of paper 9" x 9" - this helped to accommodate the sentiment from Great Grads that I'm using. If you'd like to play along - just leave a link to your graduation card on this post, or if you upload to SCS, use keyword BC45. Have a great weekend - don't forget to check out Allie's Blog Candy at Croppinsville! Very cool card. I love the look and the pockets too! Great card, Lisa! The Double Pocket will be perfect for Graduation! We had a similar thought with using a money/gift card holder! I like how you used DSP for yours...great job! 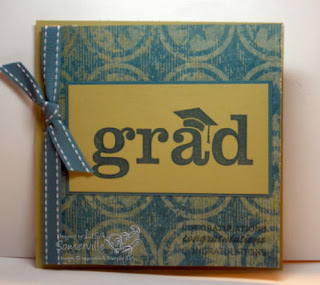 This is a fabulous adaptation...and so very perfect for any grad. Wonderful job as usual, Lisa! I think your variation is wonderful! It looks like you tucked a credit card in there -- is that his graduation gift? Lucky him! Wow, you are getting old if your son is graduating this year, lol! I am sooooo picking on you. Tell your son congratulations, I can only imagine getting to that point with my son. Your card is wonderful, I love the double pocket inside. Great job. This is excellent! 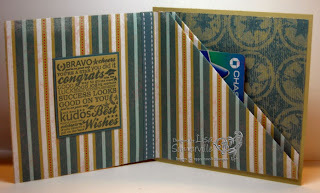 I love the rich colors, and the pocket for a little moolah is great! Fantastic card for graduation! It will hold what every graduate wants.......MONEY! What a fantastic manly grad card! Love those colors and the double pocket...I need to try that tech, yet! Great card! Love the colors and the way the papers coordinate with each other. Good job! Great graduation gift idea! The stamps and paper work perfectly together. Very cute card. I need to stamp a few as my son and friends are also graduating. Nothings impresses a kid more than a hand made card with a few presidents in it. Very cute card, now to hunt down my TJNL file folder. Great colors - it all works so well together! Very cool...great idea for a grad card...haven't tried the double pocket yet but I just might have to!